During the pontificate of Pope Pius XII, he worked closely with the Vatican on Marian publications. In light of the encyclopedic accuracy of his work, Roschini is considered as one of the top two Mariologists in the 20th century. His first major work, a four volume Mariology, Il Capolavoro di Dio, is judged to be the most comprehensive Mariological presentation in the 20th century. Several theologians called him "one of the most profound Mariologists" and "irreplaceable". - Maria Valtorta, tertiary of the Order of Servants of Mary (1897-1961). I have been studying, teaching, preaching, and writing Mariology for half a century already. To do this, I had to read innumerable works and articles of all kinds on Mary: a real Marian library. ...whoever wants to know the Blessed Virgin (a Virgin in perfect harmony with the Holy Scriptures, the Tradition of the Church, and the Church Magisterium) should draw from Valtorta's Mariology. If anyone believes my declaration is only one of those ordinary hyperbolic slogans abused by publicity, I will say this only: let them read before they judge! Fr. Roschini has written over 790 articles and miscellaneous writings, and 130 books, 66 of which were over 200 pages long. Most of his writings were devoted to Mariology. For a theologian, such as Fr. Roschini, O.S.M., to be so well-read and so learned as to have written 130 totally orthodox books about Our Lady, and to be a decorated professor at the Marianum Pontifical Faculty of Theology in Rome (which he founded), an advisor to the Holy Office, and to be called by a Pope “one of the greatest Mariologists who ever lived”, it is not presumptuous to assume that he has probably read every single great work ever written about Our Lady – including Venerable Mary of Agreda’s Mystical City of God, the revelations of Blessed Anne Catherine Emmerich, the revelations about Our Lady given to St. Bridget of Sweden, and almost every single other major work about Our Lady. Yet – even so – Fr. Roschini declared: “No other Marian writings, not even the sum total of everything I have read and studied, were able to give me as clear, as lively, as complete, as luminous, or as fascinating an image, both simple and sublime, of Mary, God's Masterpiece.” Such a declaration from such a theologian as he carries a lot of weight! Fr. Gabriel Roschini’s book is available for purchase online. Maria Valtorta died on October 12, 1961. 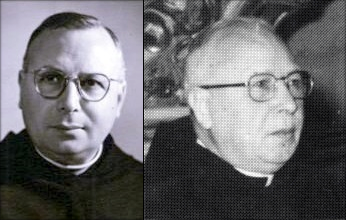 An article relates: “The rector of the Third Order of the Servants of Mary, Fr. Innocenzo M. Rovetti, assisted her at her deathbed. At the very moment the priest recited the words: Proficiscere, anima Christiana, de hoc mundo (“Depart, o Christian soul, from this world”), Maria breathed her last. Ten years after Maria Valtorta’s death, on October 12, 1971, her mortal remains were exhumed from the earth and placed in the family niche. 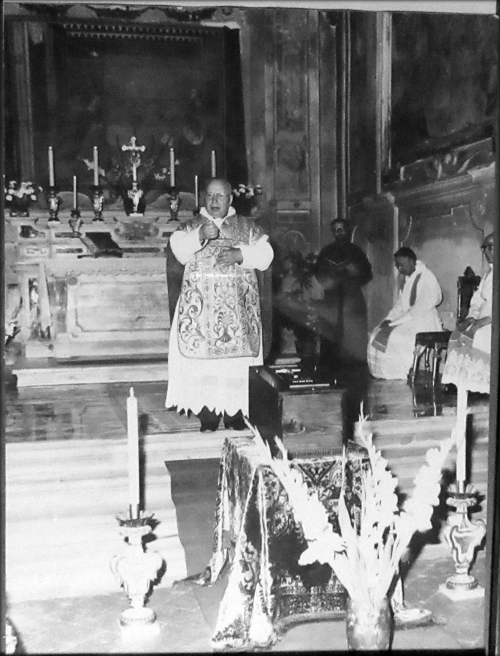 On the 2nd of July 1973, however, with civil and ecclesiastic permissions, they were transferred from Viareggio to Florence to be entombed in the Capitular Chapel in the Grand Cloister of the Basilica of the Most Holy Annunciation [the mother church of the Servite Order], where the tomb of Maria Valtorta is still venerated.”9 Fr. Gabriel Roschini, O.S.M., world-renowned Mariologist, wrote that after her death, “People noticed that her right hand – with which she had written so many sublime texts – contrarily to her left hand, retained the color, suppleness, and beauty of someone alive rather than dead.”10 Fr. Roschini presided over the relocation of the remains of Maria Valtorta from Viareggio to the Grand Cloister of the Basilica of the Most Holy Annunciation, including presiding over the Mass, giving the appropriate discourse for this occasion, and giving the blessing for her burial.11 The inscription on her tomb reads: “Divinarum Rerum Scriptrix” (Writer of Divine Things). 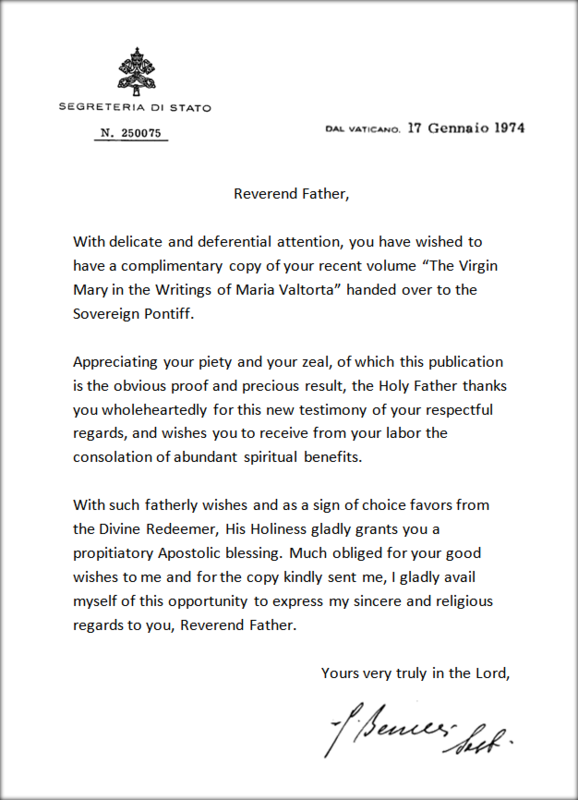 This letter, penned by the Secretariat of State and authorized by the Pope, undoubtedly conveys a positive tone, praising the author for his "piety and his zeal, for which this publication is the obvious result". It is illogical to conclude that the Pope would authorize such a letter, if he thought the writings were condemned or contained error. The Secretariat of State is highest ranked curial official next to the Pope, and is considered the Popes’ "right arm". Those who question whether the letter was written with the Pope’s authorization are advised to look up the job description for the Secretariat of State, for this is what he does. Even though the Pope may not have put the pen to the paper, the implication is the same. This event falls naturally in line with the Holy Father’s action decades earlier of sending the complete writings [of Maria Valtorta] to the Milan seminary library. The extensive Mariology contained in The Poem was also the subject of a 400-page study written by arguably the greatest Italian mariologist of the twentieth century and Consultor of the Holy Office, Rev. Gabriel Roschini, O.S.M. 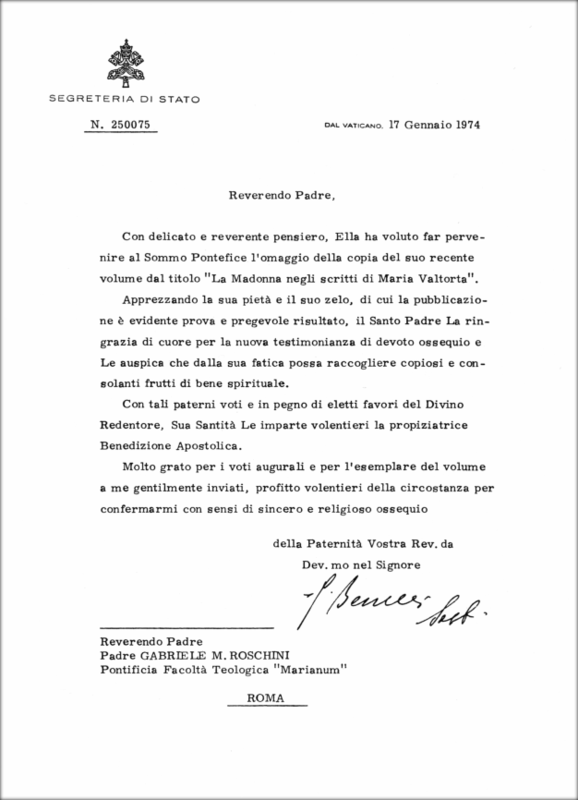 In a letter of January 17, 1974, Father Roschini received the congratulations of Pope Paul VI for his work entitled, The Virgin Mary in the Writings of Maria Valtorta. The letter from the Secretary of State notes, "The Holy Father thanks you wholeheartedly for this new testimony of your respectful regards and wishes you to receive from your labor the consolation of abundant spiritual benefits." Neither the papal benediction granted by Pope Paul VI nor the papal congratulations issued through the Secretary of State would have been granted to a text based on a series of private revelations which were "forbidden" or declared "doctrinally erroneous" by the Congregation for the Doctrine of the Faith. This article has demonstrated the significant admiration, approval, and dedication that Fr. Roschini had of Maria Valtorta and her writings. However, Fr. Roschini is not the only renowned theologian and Consultant of the Holy Office and the Congregation for the Causes of Saints who has approved, endorsed, or praised Maria Valtorta's work. 1. The Virgin Mary in the Writings of Maria Valtorta. By Fr. Gabriel M. Roschini, O.S.M. Kolbe's Publications Inc. 1989. Page XIV in the Foreword. ISBN-13: 9788879870863. 2. Gabriel Roschini. Wikipedia. Accessed online May 2016. 3. An Introduction to Maria Valtorta and Her Epic Narrative The Poem of the Man-God. Accessed online May 2016. 4. The Virgin Mary in the Writings of Maria Valtorta. Appreciation by Pope Paul VI and Translation. Op. cit. 5. The Virgin Mary in the Writings of Maria Valtorta. Page XIII in the Publisher’s Notice. Op. cit. 6. An Introduction to Maria Valtorta and Her Epic Narrative The Poem of the Man-God. Op cit. 7. The Virgin Mary in the Writings of Maria Valtorta. pp. 8-9. Op. cit. 8. The Virgin Mary in the Writings of Maria Valtorta. Foreword. Op. cit. 9. Preface to the Poem of the Man-God. Maria-Valtorta.net. Accessed online May 2016. 10. The Virgin Mary in the Writings of Maria Valtorta. p. 6. Op. cit. 11. The Virgin Mary in the Writings of Maria Valtorta. Page XIII in the Publisher’s Notice. Op. cit. 12. A Brief History of Events. Maria-Valtorta.net. 13. In Response to Various Questions Regarding "The Poem of the Man-God”. By Dr. Mark Miravalle, S.T.D. April 15, 2006.